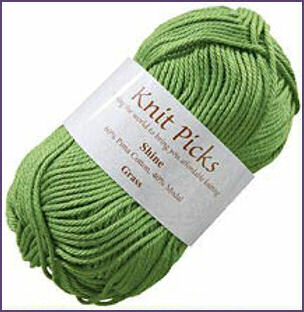 Well, today my Shine Yarn from KnitPicks finally arrived. Wowwww, what a lot of yarn! I saw the Flower Power Baby Hat in Knitty this week and I am in love! The color possibilities are endless! I think I am going to try a couple of those. Then I have this book called 1000 Great Knitting Motifs and it is generating lots of ideas. I want to make a couple of hats for my mom and this yarn seems soft enough that it won’t hurt her sensitive head. The chemo is over now, but it has been rough on her and I think it will be a couple of months before she’s back to her old self. Would I be bragging too much if I said how much I am loving Ravelry? I’m tellin’ you, it’s like a drug. I can’t stop poking around and looking at people’s projects. I am also enjoying the huge sense of community there and I am loving all of the resources I can find with just a few clicks. My favorite thing? Say I like a project, like the aforementioned Flower Power hat. All I have to do is enter that project into my queue and it finds all of the other people who are making it or who have made it already. COOL. It’s a great way to get new ideas. Lookie what I got with my yarn! I’ve been waiting to get these <a mce_thref=” />Harmony needles and give them a spin. More on these later, I suppose. Yes, I know I said I’d have to wait for Christmas, but you know, I just had to have wooden needles for that slick cotton yarn! Right? A necessity! A lot of the commonly used sizes are on backorder already. This is what I could get for now, but I think it will do the trick. Ok, on Monday, I caved and bought yarn. Not just a little yarn. A LOT of yarn. What was I thinking?? I bought TWO balls of every available color of KnitPicks Shine yarn. When I make hats, I like to have lots of colors at my fingertips so I can have the option to do fun and funky designs. 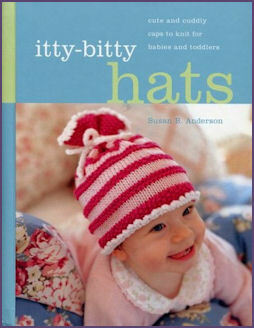 I want to make a stack of baby hats for a co-worker, and also a cotton cap for my mom, who is going through chemo and needs a hat, but everything is itchy to her. I think this yarn will be just the thing. Of course to go with the yarn I had to get a couple pairs of KnitPicks Harmony needles to go with it. I got two pairs of size 4, so I can have the option to do more than one project at once. I noticed while ordering that many of the needle tip sizes are already on backorder. I can’t wait to receive mine. I got an email yesterday saying my box had been shipped so it will be fun. 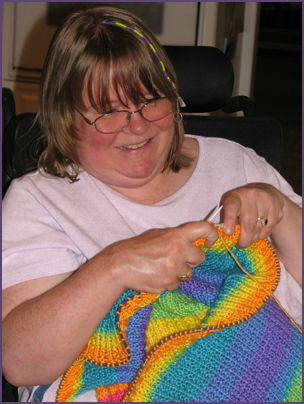 I’m working hard to finish my rainbow baby blanket so I can move on with a clean conscience. I still am working on the very last stripe, then I have to weave in all those ends! I am planning also to add a blue border, to help make the blankie a little more boyish for the recipient. Boy, will I be glad to be done… I can’t WAIT to get started on my hats! I’m In with the In Crowd! Wow! At about this time yesterday, after more than two months of waiting, I finally received my Ravelry invitation! I’ve only begun to scratch the surface of all that this wonderful tool can do. It has a way to help you catalog and track your projects, track your stash, catalog your books, needles and other tools, and share in projects with others who might be working on the same thing. A quick search showed me that there are about 5 other people so far who are from my town that are Ravelry members. I don’t know any of them, except one girl who I know I went to college with, but I don’t think she remembers me. Maybe I will contact them and suggest a knit-in at our local Borders. There is actually a Borders group that meets on Wednesday nights but I can’t go, so I’m looking for some Saturday people. I had an absolutely great time knitting with Rhoda this weekend. Guess what she brought for show and tell? 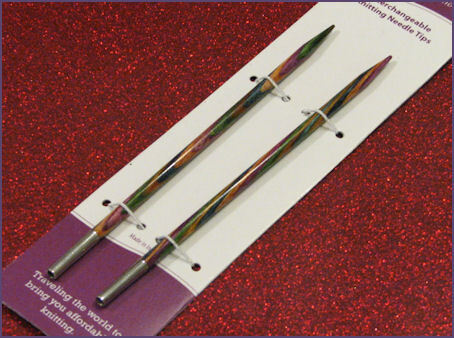 The new KnitPicks Harmony Needles! Ooooooh my! They certainly are pretty! I hope I can restrain myself all the way until Christmas! Kelley, what have you done to me now?? We enjoyed a pizza for lunch and then knitted while listening to some of my favorite podcasts. Then the power went out. For no reason at all, I might add. Go figure. Yay! I’m starting the last stripe of my baby blanket. Finally! My daughter decided that she needed to snap this photo of me the other day, and is insisting that I put it on my blog. So here it is, with full photo credit to Diana. But, boy… I sure am tired at seeing that fat person in those photos! Who is she, anyway? Someone who wants to be done knitting a baby blanket, that’s who! What was I thinking, anyway, doing such a large project? I think this confirms for me that I am a small project kind of gal. I’m fine with that. I am still trying to decide whether the blanket needs an edging. I probably will, to increase the amount of blue in the pattern, since the baby is a boy. Now another co-worker is pregnant so I think next time I will do a pile of baby hats and socks. The baby is due at Christmas and is a girl. Yay, one of each to knit for this year. How fun! 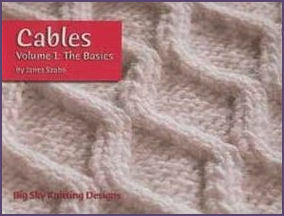 Yesterday I received the book, Cables Volume 1: The Basics by Janet Szabo. I love this book! Ok, I think I’m a book ho. But seriously. Still. This is a good one. If you love cables like I do, or a shameless fan of Janet’s work, as I am, Go. Now. The book is chock full of photos and very clear instructions. The photos are black and white, which I think is a good thing, because sometimes color can be distracting in cables. So it’s really easy to see the work. She also discusses cabling without a cable needle right up front, which is how I do it, and I think that’s a very useful thing. Makes cables go a lot faster! Each chapter talks about different types of cables with photos and instructions in charts and words, and also gives you challenges to try other cabling experiments. There’s even a chapter on designing your own cables. How cool! Wow. 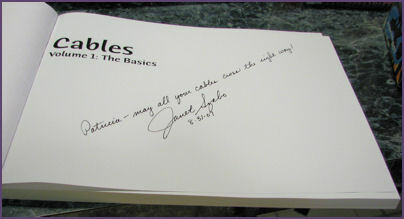 I wasn’t expecting a SIGNED copy! It says, “Patricia, may all your cables cross the right way!” But hey, even if they don’t, there’s a section in the book on fixing cables. If Volume 1 is this good, I already can’t wait for Volume 2! I have already asked for these for Christmas. Until then I must maintain my resolve and NOT be tempted to buy! I shall wait. Until Christmas. Christmas is good. Meanwhile I will continue slogging away on my rainbow stripey baby blanket. I’m so close to being done on my main knitting that I can taste it. I’m in the middle of my second-to-last stripe, and then I have to weave in the ends! Then there’s the question of the border. should it have one, or should I leave it? I don’t know that I have decided for sure either way yet. I bought this hat quite a number of years ago at a local craft fair. The lady who sold it to me said it is made of plain old Red Heart yarn and it is crocheted. 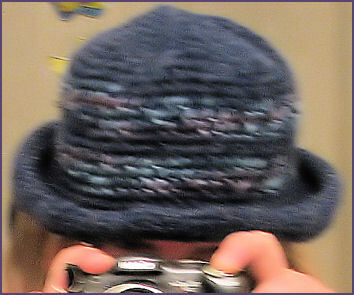 I loved it so much I immediately set out to emulate it, hence my start of the love of making hats! I never quite achieved the same thickness with the hats I tried, but I never used Red Heart, either. Perhaps if I had used a stiffer yarn and even smaller hook. It is made with two strands together. Well, I don’t crochet anymore and I have yet to find a knitting pattern that produces this stiff of a fabric without felting. But I am going to try to do it. I am sure it can be done. The first question is of course how to attain the flat top shape, which requires a bit more thought with knitting than with crochet. I posted yesterday to two of my knitting communities, KnitTalk and KnitHatsNow. I’ve received quite a few tips so far. Linda suggests that I knit an I-cord tube of 8 stitches until the stitches don’t have a ladder anymore, then switch to working yarn and begin increasing in multiples of 8 stitches. Depending on how and where I do the increases, the top of the hat could look like a spiral, or it could look like a wheel with spokes. I’ll have to see which I like. Carol pointed me to a pattern online for a hat with a brim. 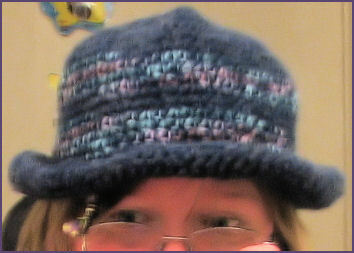 This one doesn’t quite have the shaping I want, but it is a cute hat! Rita pointed me to Emily Ocker’s Cast On, illustrated by Theresa Stenersen, whose Techniques with Theresa articles are a staple at Knitty.com. This cast on looks really helpful for the type of hat I am planning to try and I think I will use this technique. Theresa’s articles and tips are always so clear and I love them. Bonnie then mentioned this round pinwheel blanket pattern by Genia. Wow, the knitting world is small — Genia is the kind lady who taught my daughter Diana to knit. This pattern shows another way to do the increases to achieve a flat circle.